It’s that time of year when everyone gets together to see their loved ones for the holidays. Or even those fantastic work holiday parties that your company may hold, believe it or not I miss going to a company holiday party! Well why not host your own holiday gathering! Connie from The Foodie Army Wife is hosting this fabulous party and the #SundaySupper group has gotten together to provide you with some amazing appetizer and drink recipes for your next party!! I decided to make a drink, as I was searching for what to make, I drooled over the holiday alcoholic ones, I then thought maybe I’m better off making an appetizer because I can’t have alcohol this holiday season because of my little bambino, but there is always next year! 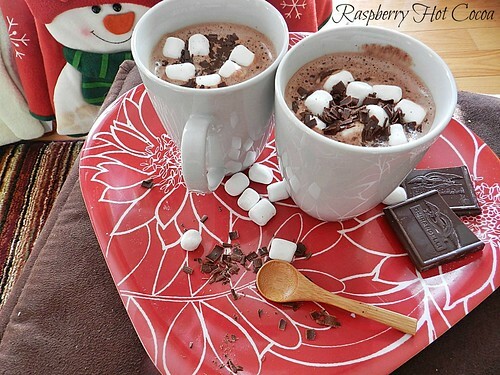 Then I came across this awesome recipe for Raspberry Hot Cocoa, I knew this would be something my husband and I would enjoy some cold wintry night! Place the raspberries, chocolate and sugar in a blender; cover. While processing, gradually add hot milk in a steady stream. Strain; discard seeds. 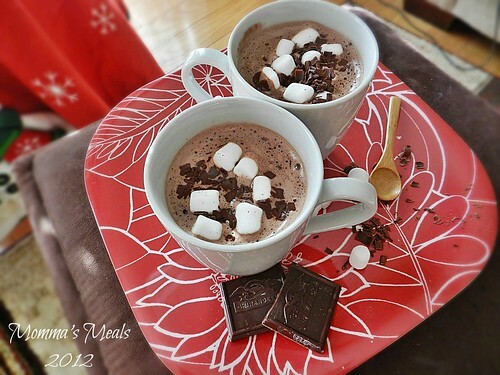 Serve in mugs; top with whipped cream, marshmallows and chocolate if desired. Yield: 4 servings. 1 cup (calculated without toppings) equals 325 calories, 17 g fat (10 g saturated fat), 14 mg cholesterol, 92 mg sodium, 38 g carbohydrate, 4 g fiber, 10 g protein. Now lets go check out what everyone else has made for this wonderful party we are holding! 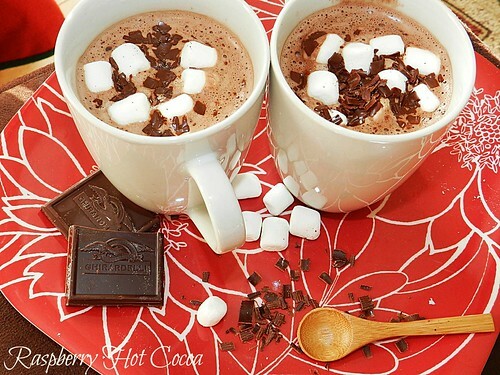 Nice hot chocolate recipe! I love the use of real raspberries instead of a flavoring. It’s cold and rainy here today. I need this now! YUM! Looks yummy, it’s a cold morning here in Los Angeles I think I will make today. Yum, what a great recipe for the holidays. Ooo, this looks very, very yummy. I love drinking cocoa when we have been out in the cold – which happens a lot here in Alaska! 🙂 Besides all the coffee I drink, cocoa is a hot second! With actual raspberries, love the idea! A fantastic drink! Oh my! I bet if you used raspberry-infused chocolate too it’d be even better! Mmmmm. My husband would absolutely LOVE a mug of this! Sounds amazing. Chocolate and raspberries are heaven together!!! What a wonderful drink this is. Squeal! I LOVE hot chocolate and the use of real raspberries here takes it over the top. I wish I had a giant mug right now with marshmallows and whipped cream. Hey, it’s Christmas – if I can’t indulge now, when can I (ok, the answer is that I indulge all the time *shame fame*). Happy holidays! Mmmmmmm….this would be perfect when we get our first snowfall!!! Raspberry and chocolate are so good together! This sounds wonderful – not a typical flavor for this time of year, but a great combination of flavors! Nothing beats a cup of hot chocolate. The raspberry is another reason to smile! I would love a cup of this right now! It happens that I have frozen raspberrys (not very common, because in Spain they are very very expensive), minimashmallows and plenty of cocoa. You know what I’m going to do this sunday afternoon?? What a fun idea! I never thought of putting fruit in hot chocolate, but I’ll have to give it a try now! I love that you used real raspberries and not a flavoring! And Ghirardelli – my biggest pregnancy craving!! Yumm, kids love hot choc and this would make a welcome twist !! Oh I didnt guess it would use fresh/frozen raspberries! I figured maybe it was raspberry cocoa or even raspberry jam. Yum!